How to use Basic and Advanced search? How to create filters? In Basic search you can easily find a person by his basic account data: name, last name, position, department, email, phone number. 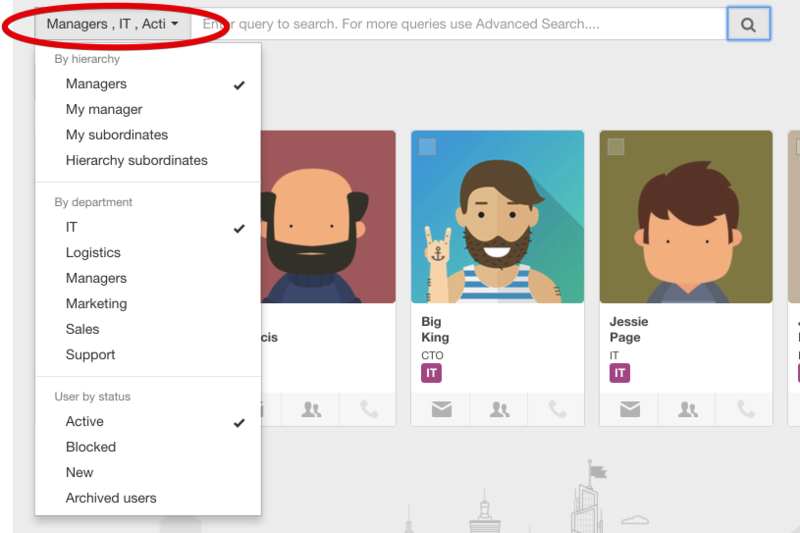 You can also filter users by hierarchy, by department or by status. Here several options can be ticked at the same time but only one per block. You can Put away the tick by simply clicking on the chosen option again and it will disappear. Select fields by choosing what you need from account data, profile data, competence, experience, etc. Combine different variants by choosing, "and", "or", adding rules and groups. Click Reset to clear the selected fields. If you want to save filters to easily use them in future, first set your requirements by selecting fields to search. Input the Title, click tick to save and refresh the page. 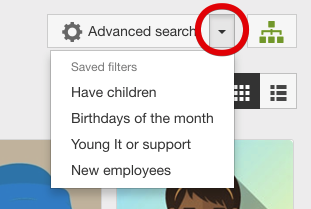 After refreshing your presaved filters will be available in the drop-down list beneath the advanced search button. Next time you need it, simply choose one from the list and in a blink of an eye you will get the list of users selected according to your settings.